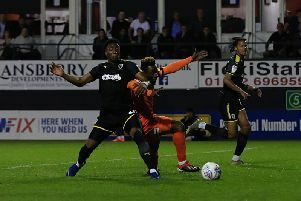 Luton Town bounced back from their 3-2 defeat against Wycombe with an excellent performance on Saturday, as they beat Exeter City 1-0 at Kenilworth Road. Here’s how the Hatters rated on the day. Marek Stech: 7 - Surely couldn’t have expected to have such a quiet afternoon against one of Town’s genuine promotion rivals. One save in either half and that was it. Clearly fouled for the disallowed goal too. Jack Stacey: 8.5 - Much improved from Tuesday night as he was a real threat, continually getting up and down the right hand side against his former club. Had a great chance to score only to properly balloon it into the stands. Dan Potts: 9 - Overlapped Berry time and time again and it was his burst forward that proved integral to the winner, nipping through a gap and teeing up Cornick. Solid defensively too as the visitors never had a sniff. Alan Sheehan: 9 - Made sure Stockley didn’t have a second to bring the ball down, buffeting him at every chance as the former Town striker didn’t have anywhere near the kind of influence he had in the reverse game. Glen Rea: 9 - Like Sheehan, ensured that Exeter barely had a sight of Town’s goal all afternoon. Brilliant block prevented Edwards’ effort from testing Stech as well as he helped keep another clean sheet. Flynn Downes (STAR MAN): 9 - Belied his tender years to produce what surely has to be one the best debuts from an on-loan teenager in recent times. Calm on the ball, good vision and range of passing, added some steel too. Hugely promising. Olly Lee: 7.5 - Got about the pitch well as Luton made sure they won the midfield battle this time. Tested Pym from distance and saw a few other goalbound efforts blocked away. Luke Berry: 8.5 - Linked up superbly with Potts on the left hand side and was a big part of Town’s dominance on the day, constantly picking the ball up and carrying it well, as Town stayed on the front foot for the majority of the game. Harry Cornick: 9 - Offered pace and power galore as his lung bursting runs pinned the Grecians defence back. Unlucky to be denied by the post, but this was rectified by the element of fortune in his winner. If he can work on his final ball, Hatters have some player. James Collins: 7 - Worked hard as Town’s central threat and saw his cross-shot clip the woodwork on its way over. Took up plenty of good positions, but couldn’t quite be found. Danny Hylton (SUB): 6.5 - Real boost to see him back on for a brief cameo in the closing stages. Lloyd Jones (SUB): 6 - Added some height to Town’s back-line for the final moments.